I have a Silverface 69-69 with drip edge, It has been chopped down to just a “head” configuration, needing an external speaker cabinet, which I have paired with a Celestion 70-80. Anyone know how this affects the value? If your amp has bewn chopped and made into a head only, the value of resale is greatly lowered. It retains person value to anyone that wants to achieve that warm tube sound. I have a 75 silverface with an old altec lansing replacement speaker. I love this amp have it since 1980. Will never sell. Thanks, thought so re the value. The real important thing is the sound which is great. 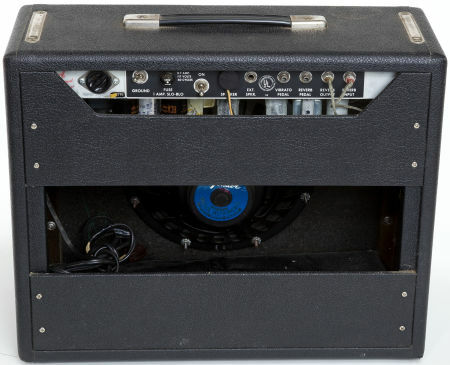 I have one of these amps .I believe its a 69. I have had it for about 8 years and have yet to figure out what the ground switch on the back does. Any ideas? The ground switch was used (I believe) to switch which prong of the old 2 prong cord you would ground through. One side would have less hum than the other, depending. Don’t quote me on that. However! Does your amp currently have a 3-prong plug? If not, you should take it to a tech to have that done. The ground switch should be taken out of the circuit and made to be useless. If it does have a 3-prong plug, this has likely been done already. Hey, Walter. Rob is exactly right. The ground selector switch lets you connect either conductor from an antique 2-conductor power cord to the chassis of the amp, through a capacitor. This is often called the “death cap,” because if it shorts out, and you just happen to have the ground selected to the “hot” conductor, the amp chassis is now at 120 V. So if you touch the strings on your guitar and something else that is grounded correctly, it completes the circuit – through your body (possibly stopping or fibrilating your heart). If the “death cap” is in perfect condition, it isn’t a problem. But as capacitors age (and many of them are 40 or 50 years old by now), it becomes more and more likely that they will either fail open or shorted. I agree with Rob, that the modern safety-minded logic is to remove the death cap (or just disconnect it from one end and leave it retired in place so that the amp “looks” original inside) and then correctly install a modern 3-conductor power cord. Of course, this only works if the outlet you are plugging into is wired correctly – which isn’t always the case. Luckily, outlet safety testers are easy to find. Just plug one into the outlet that you plan to use, and it tells you whether or not the outlet is wired correctly – by the response of a couple of LEDs. Rob & Gary are both correct. But as an amp tech I highly recommend Rob suggestion of eliminating the Ground switch (and death cap) and installing a 3 pronged power cord. Hi there. My 79 speaker is blown and trying to decide what I want to replace with. Will never sell so don’t care about value. Want to go 75 watts and I like a warm sound. I like all genres so want blues to playing something with aggression when I feel the need. Any suggestions? 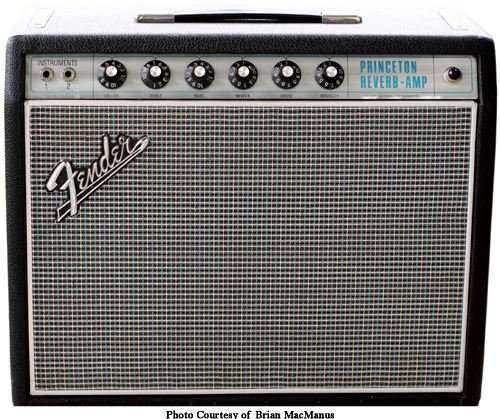 Hello, I have in the past heard two 1976 Fender Princeton Reverbs that had that nice warm tone which made them both similar sounding. But one sounded more blackface circuit and broke up a little earlier before 5 on the Volume. The other had to be turned up to 4and a half or 5 on the dial volume for it to start to brake up a little. I liked that one better. It had a warmer beefier Silverface cleaner sound. The other one that broke up earlier sounded good but definitely Blackface sounding according to my friend. My question to you is how can two of the same amp and year ( 1976 ) sound different? Is the cleaner one less Blackface sounding Princeton Reverb AB 1270? inside this amp? And the more Blackface sounding one AA 1164? built in that amp? How does it work? Or is it the Tubes, or types of Tubes in the amps that change the sound and circuit? Is this why they sound different. We were comparing sound and playing both amps clean with no effects. Guitar to Amp plugged straight in. 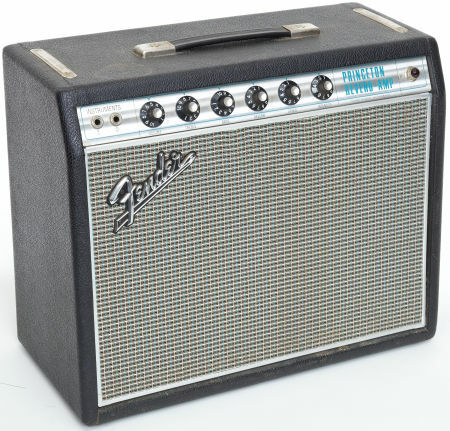 I have decided to try and grab a 1976 Princeton Reverb and I want that more clean, Silverface warmth versus Blackface sound. But how do I know which one has that sound without hearing it? I’m probably going to have to snag one on E bay . Thank you, Greg.